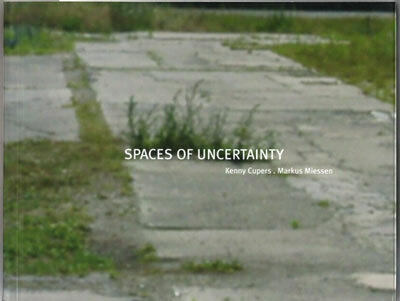 Spaces of Uncertainty is a collaborative of two architects, Kenny Cupers and Markus Miessen, working at different institutions and locations. They do not form an office, but present a collection of ideas about architecture and spatial practice. Their collaborative work started off in Berlin in 2002, where they worked on a publication, Spaces of Uncertainty. Moving between urbanism, sociology and the visual arts, this project presented urban research and a photographic essay on the life of leftover spaces in Berlin. By documenting activities such as leisure, temporary living, urban agriculture, informal trade, and social encounters, the research addressed the micro-politics of public space, thereby adding energetic realism to the overwhelming rhetoric of loss that dominates the current discourse. An international exhibition continued this investigation with three case studies in Berlin, Brussels and London. Their recent ongoing work attempts to rethink the position from which to intervene in the spatial practices that make up urban societies today. Leaving the vertical position of the architect to roam the network of urban situations, it aims to develop research strategies geared towards spatial practice. The exploration of urban culture as a process unfolding in a multiplicity of spaces, allows the terrain of action to shift towards the multifaceted dynamics of the contemporary city. With contributions by Margaret Crawford, Hilde Heynen, Paul Davies, Paul Halliday et al.